Well, that little break was nice. My Thanksgiving holiday was lovely, just as I had hoped. We spent lots of time at home enjoying each other's company (and eating too much!). Thinking back, I don't quite remember what we did, all the days blended together. But I do feel rested, so that's a good thing. One of my favorite events of the past few days was my outing with Lily on Saturday. We went fabric shopping, had lunch, then visited our local yarn shop. It was her first time. I have a little fiber lover on my hands for sure. It was so funny hearing her say "that's awesome!" about the yarn. She had no idea that a place like that existed. I think she was most impressed with the ladies sitting around knitting. We hit the sale room and each picked up some yarn for a small project. When I learned to knit, I first knit a scarf, then jumped right in on sweaters. I skipped over the little projects, but now I feel like revisiting them. I didn't plan to, but I'm making a scarf. I may keep it for myself, or not. This yarn is pretty! I wish I had saved the tag...all I know is that it's Noro. I suppose my break was quite knit heavy. Even before I started the scarf, I totally abandoned my whisper (the cuff is still waiting) and jumped in on tea leaves. I love knitting this style of sweater. It's very similar to the numerous baby sweaters I've made, so it's fun to be making a grown up version. This is totally unrelated, but Ava was at it again. I'm sure y'all won't be surprised by this, but she managed to give Ruby a haircut. Ava, Ava, Ava!!! Have a great week, friends - be grateful you don't have a 3 yr old giving your dog a haircut! There's no hustle and bustle for us this Thanksgiving week. Matt and the kids are out of school. We don't have much planned other than dinner at my in-laws on turkey day. Black Friday? No, thank-you. That sort of craziness isn't my cup of tea...unless it is some sort of on-line deal that doesn't require me to leave my house. This week I look forward to the quiet of low key evenings with my family. We have a 1500 piece puzzle in progress and movie watching is in order. The other day I picked up some cookie making supplies, so I'm sure there will be some cookie making in my near future as well. Craft-wise, all I feel like doing is hand sewing and knitting. My second alabama stitch skirt is sooo close to being done. My goal is to wear it on Thanksgiving. It's nice and stretchy, perfect for a feast. My featherweight cardigan is also very close to completion...only a sleeve ribbing to go. The collar on this thing is curling like crazy, so it's going to need some serious blocking. I wanted this done in time for Christmas, so I can almost pat myself on the back for that one...as long as another project doesn't hop on my needles and keep me from finishing (the yarn was in my stash...couldn't resist!). So yes, I'm feeling quiet. Quietly counting my blessings and quietly working on my projects while I soak up this time with my (not-so-quiet) family. Happy Thanksgiving, friends! I had a lunch date today with my special boy. We ate Thanksgiving dinner in the school cafeteria. My boy is such a gentleman. I told him that I wasn't sure what to do, so he got my plate for me and put the utensils in their proper spot. Everything has a spot, you know. When we sat down at the table he opened my utensils (they're in plastic wrap) and put my straw in my milk...chocolate milk. At last year's dinner with Lily I ended up giving the boy next to us a milk shower while inserting my straw. It's a good thing he helped me out. After our meal, he gave me lots of hugs and a few kisses. He didn't even care that his friends were looking. I'm so smitten. Yep, he's my special boy! Sorry to talk about the weekend late on a Tuesday night, but I was a little distracted yesterday. I stayed up way too late making that bag Sunday night and couldn't wait to tell you about it, I'm sure you understand. Thanks for all the bag love! On Saturday morning I decided that we should get out of the house and DO something. After a week of being cooped up in a germy house, we needed to get out. It had been a while since we got out to do something fun as a family, so it was time. At first we couldn't decide what to do, where to go, if we should go on Saturday or Sunday, but then we just did it. No planning. We got dressed, told the kids to wear comfortable shoes, and took off to the Audubon Zoo. We've kept a family membership to the zoo since Lily was a baby, so going to the zoo is nothing new for us, but it had been a while. On the ride there we talked about what animal we most want to see. Alex wanted to see a giraffe and Ava was all about zebras. She went on and on about how she wanted to ride and pet a zebra. I loved hearing them chatter about what they were going to see once we got there. I think this was the first time that she was old enough to really enjoy going to the zoo and remember it. She hasn't stopped talking about it and keeps asking to go back. I think Alex belonged in the monkey habitat. That boy kept climbing on everything. He would have climbed in with the animals if he could. We checked out the new dinosaur exhibit that was set up where the birds usually are. The place was all misty with robot dinosaurs that moved and roared. Ava did not like this one bit. She FREAKED out, poor baby. She kept her head buried in Matt's shoulder the whole time. He had to leave while I stayed with the other kids. Leave it to Alex to try to climb the dinosaurs. Yep, he tried it. Before leaving we had to stop by Monkey Hill to let the kids burn off some energy before the ride home. Alex had no problem with that. Rolling down the hill wasn't fast enough, he preferred to RUN...straight into me at the bottom of the hill. It was such a fun day. We're finally at that point as a family where we can pick up and do things like this with no constraints. There were no diapers to deal with, no naps to work around, no strollers and special accessories to tote around, just us and a free day. We took our time and enjoyed the sights. We played in the fountains and climbed trees. There was lunch at the zoo cafe, we rode the train and bought souvenirs. By the end of the day all three kids [and parents] were pooped - they all zonked out on the ride home. We definitely need to do things like this more often. I love this little family of mine! LOVE!! Ever since I made the first appliqued phoebe, I wanted one for myself, but larger. I probably should learn to carry a smaller bag, but I'm a big bag girl, especially now that I carry around some knitting or hand sewing with me. Not wanting to draft a large size phoebe, I put the idea off until something came to me. It hit me yesterday that I could use the pleated pocket pattern that I'm currently working on, but instead of using the pleated pocket piece, I could use the pocket lining piece to make a plain pocket, perfect for adorning with my "leaves". I was actually going for a random leaf pattern, but once I had them laid out I decided to make distinct stems. This gave me a chance to draw with the thread, which was fun. I've never done anything like that. I had to do a bit of seam ripping here and there, but I think it turned out okay. 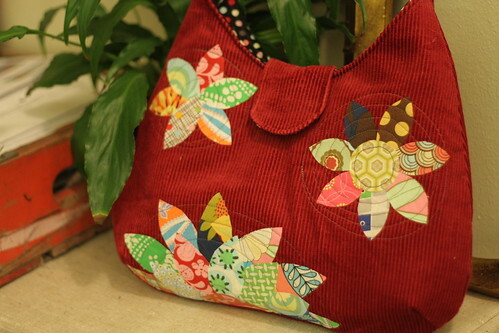 Unlike my other versions of this bag, I chose to make the exterior out of one fabric. I think mixing up patterns would have been too much with the applique. I love this woven fabric and used every single bit I had left of it. This fabric has been in my stash forever, at least 13 years (sometimes being a pack-rat is a good thing). I got it back when I worked at a fabric store. The store had a settee slipcovered in this fabric and I got to take home the scraps. I also bought some yardage and still have some floor pillows covered with it. I'd call that a pretty good fabric, don't you think? 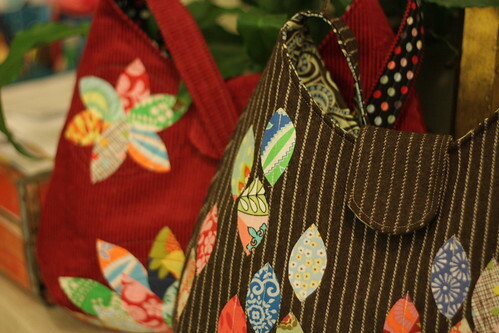 Because the exterior fabric was so sturdy, I did add a fun printed lining. *you'll have the excuse the wonkiness of it - it's already full of my stuff! Now that I've made this version, I'm motivated to finish up this pattern. I'm sure you guessed it, I was working on more appliqued phoebes. I wanted to try something a little different this time. The cooler temps and lower humidity we've been experiencing down here have influenced my fabric choices. One bag is made from wool and the other is corduroy. I'm all about cozy and warm, not that it is actually cool enough to wear those fabrics. I guess if you can't wear them on your body, wearing them on a bag is the next best thing. I really like the pops of color against such wintry fabrics. 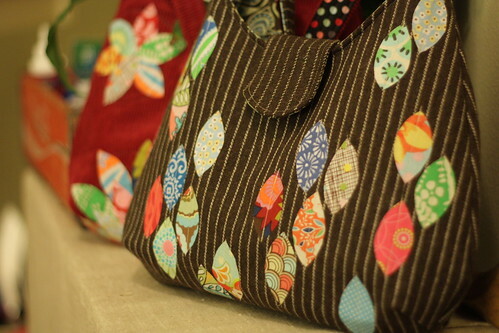 To carry that theme further, I chose to line both bags with fun prints that mimicked the colors on the outside. 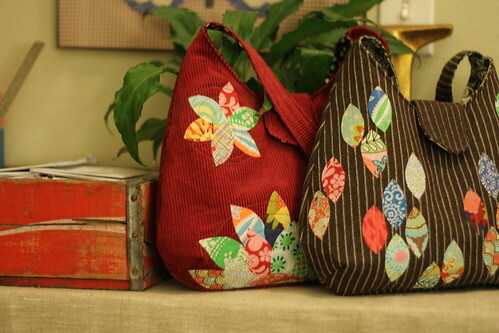 The red bag is very similar to the first, with the addition a few more flowers, but the wool one is quite different. This design happened by accident, but I like how it turned out. I have a few more designs with the "leaves" that I'd like to try out, but I couldn't find the right base fabric to put them on. I guess I'll have to wait on that one. Both of these should be in my shop some time this weekend. 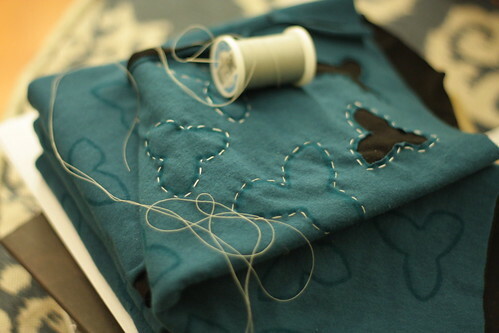 I also started on a new skirt, teal with black. My first thought was to use black thread to do the stitching but after doing one, I didn't like it. The black thread disappeared. What's the point of all those stitches if you can't see them? I switched to white, but it was too stark. I'm sure I'm being too particular, but the light gray seem just right. Don't expect this one to be done in a week, I plan to enjoy this one. Stitching in my down time, my new favorite way to relax. The sickness seems to be lifting from my household, thank goodness. I'm ready to be back to normal, crazy schedule and all! Have a great weekend! by the end of the day *something* will be made! Here it is, the finished Margaret's Hope Chest quilt. I didn't get it in the mail today, like I had planned, but I think tomorrow will be fine. I had to keep it an extra day to get some photos of it. I didn't finish the binding until late last night, then it needed to be washed. When the call went out through Craft Hope to make a quilt for those in need, I knew that I had to do it. 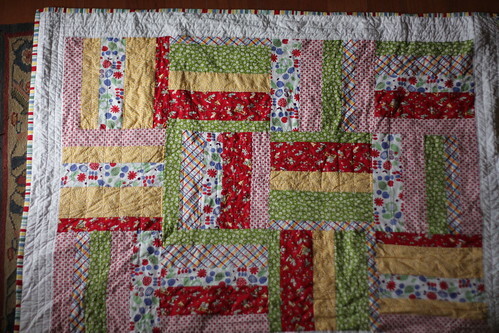 My goal for this quilt was for it to be cheery and non-gender specific. 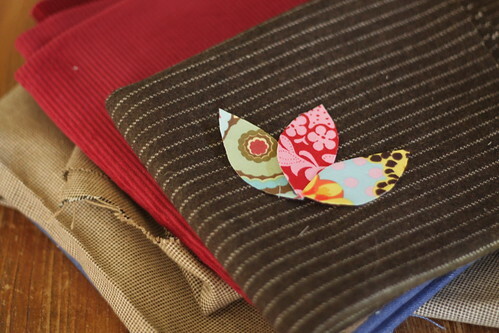 I pulled some fabrics from my stash that fit the bill, then started cutting away. I didn't use a pattern, but started by cutting 3 strips from each of my fabrics, varying in width from 2-4". Next, I sewed my strips together randomly, trying not to sew two of the same fabrics together. I did this in 3-4 strip groupings, resulting in 4 groups of strips. I pressed my sewn groups and figured that I could make 12 12.5" blocks from what I had (3 blocks from each sewn group of strips). I ended up having to cut a few more strips to make some groupings wide enough, but that was easy enough. 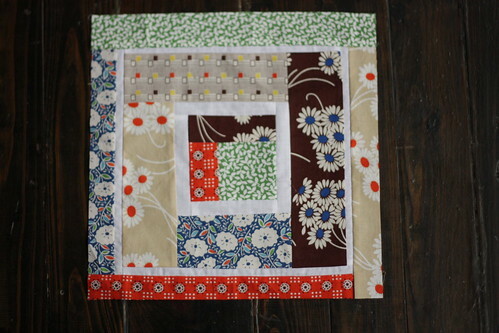 I then sewed my blocks together rotating the strips. The quilt wasn't quite wide enough, so I added a border. 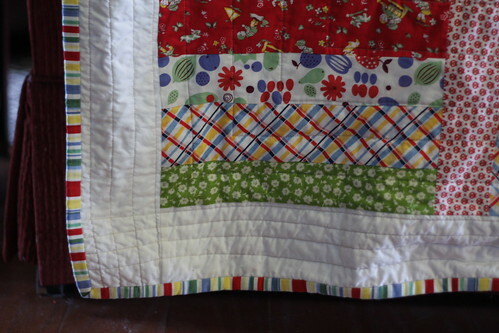 Due to my time restraint, I backed the quilt with one solid piece of fabric. I quilted it with my usual squared spiral, then bound it with the fun stripe to give it a little kick. Individually, none of these fabrics really jumped out at me, which is probably why they've been sitting in my stash for a while, but I love how they all work together. 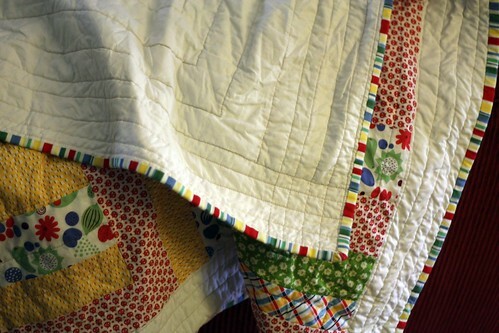 While I made this quilt, I thought about it bringing a little bit of comfort and joy to the recipient. I also kept the family of Margaret in my mind, focusing on the positive endeavor brought about through such a tragic event. I hope that my own positive thoughts and love are felt by the person who receives it. Thank you Craft Hope for such a fulfilling project. Things have been pretty quiet around here this weekend. We don't normally have busy weekends, but this weekend was supposed to be one of the busier ones due to soccer games and the kids' school fall festival. By late Friday night Lily started feeling bad and by Saturday morning has a 103 fever, so off to the Dr. we went. She was just getting over a sinus infection and we've been keeping a close eye on her asthma due to recent flare ups, so we wanted to make sure that things were okay. Poor girl has the flu, most probably h1n1 since that's the only strain they've been seeing in these parts. We sent the younger two to their grandparent's house just to be on the safe side, so it was very quiet around here. 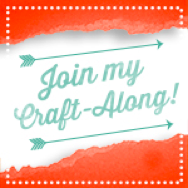 I used this down time to cast on a new knitting project, clean up my sewing room, do LOTS of laundry, finish up the craft hope quilt (still working on the binding) and catch up on my 12 square blocks. Sarah allowed us to make whatever type of block we wanted. Her only request was that if we add any fabrics to please use a white or yellow toned fabric to lighten it up. Okay, that's exactly what I did. I love a pop of white in a quilt so I added 2 white frames. I started out making a log cabin-ish block, but then it evolved into this. I have problems doing proper log cabins, as you'll see in the next block. 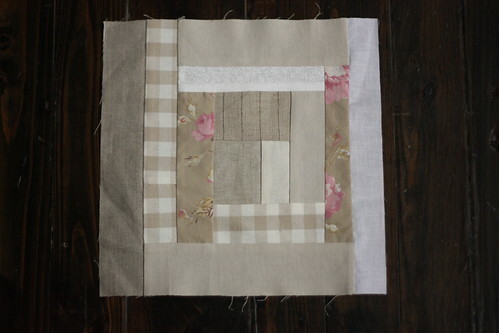 Katie did ask for a log cabin block, a scrappy one. If you've ever visited her blog, you'd know that this block is so totally her. 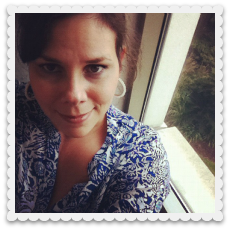 That girl loves white and linen! Her only request was that if we added any fabrics that it be white or linen :-) I had a few in my stash that worked. I'm not usually a monochromatic person, but I love this. This will be such a pretty quilt when assembled. So feminine. And last but certainly not least, Chris sent us a bunch of vintage sheet pieces and asked for rows. That seemed like a simple enough request. If we were to add any fabrics, they were to be more vintage sheets or white. 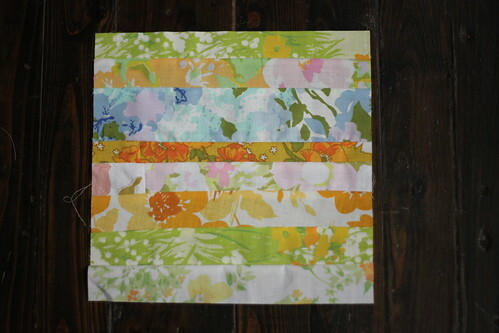 Well friends, I have oodles of vintage sheet scraps. 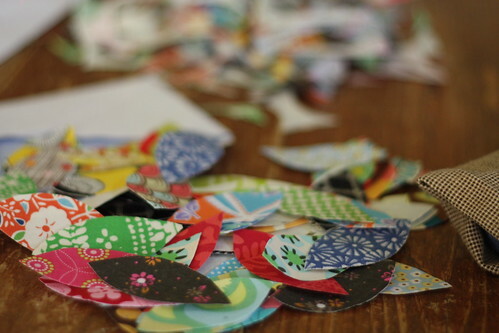 By the way, searching for these scraps was how the sewing room, clean up happened. I had so much fun and had so much material for this one, that I made another. I easily could have made 5 more. 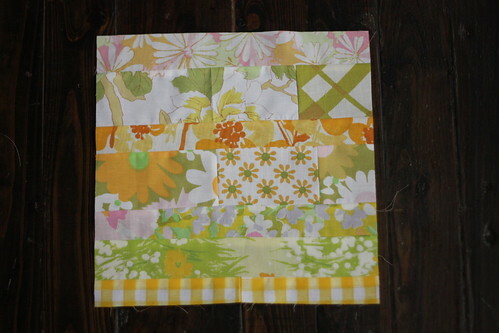 In fact, I'm thinking about making more blocks to do one of my own (just call me copy cat). I hope you can use the extra block, Chris. If you need some more to even it out, just let me know. Well friends, a quilt is calling. Enjoy the rest of your weekend and have a great week! Now that it is Thursday already and I haven't done a thing other than the painting night, I realize that my craft to-do list was only a dream. And with the kids' soccer games this weekend, on both Saturday and Sunday, it looks like I won't be getting much done then either. Dang! There's nothing scheduled tonight and the house is fairly picked up, so maybe, just maybe I can do some work on that quilt. 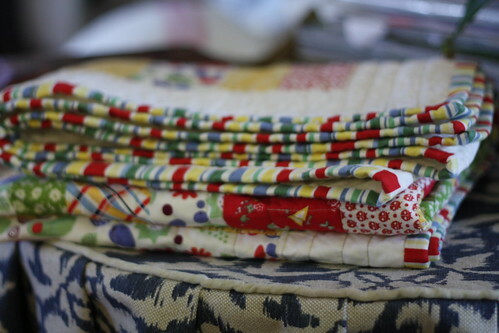 Speaking of quilts, I'm still behind on my 12 square quilt squares (what's new? ), which officially ended in September. I definitely need to move that one up on the priority list. Some squares have started rolling in from the PTQB, which is exciting. I love what those girls have come up with. I have a feeling that a certain 8 yr old will take this quilt over once it is made. It is right up her alley. This really does deserve a post on its own, but that little Ava of mine is something! She acts all sweet, but underneath she's a little spitfire. All my kids have done some stupid stuff, but she seems to do it 10x's worse. Just this week she dumped an entire bottle of fingernail polish in the sink - HOT pink. The nail polish was out of her reach, but she figured out a way to get to it. The entire sink is now HOT pink. I haven't taken the time to kill some brain cells cleaning that stuff off. On Monday afternoon she and Alex were innocently coloring on my bed, but then Ava decided to color ON my bed - the blanket, the sheets, and my coverlet, all of which I just washed on Saturday. It will wash out, but I'd like to have clean bedding for at least a few days. Is that too much to ask? While she was at it, she also colored all over the back of my bedroom door with a crayon. I was hoping that was it, but then yesterday I noticed something funny about Oreo, our cat. Is his fur pink? Why yes, it was pink, and not just a little bit. What the??? SOMEBODY colored the cat. I asked the kids and they all denied it. Then I questioned Ava some more. I told her that she wouldn't be in trouble, I just wanted to know how she did it. She answered me "Oreo was sleeping on Alex's bed, so I colored him". ***this photo was from today, so he's had a few days to clean it off. his paw was the only thing we could keep still enough to photograph, taking a picture of a cat is really hard! If she's quiet and you ask her what she's doing, she'll answer "anything, mama". Oh, how right she is! That girl, what in the world am I going to do with her?? ?